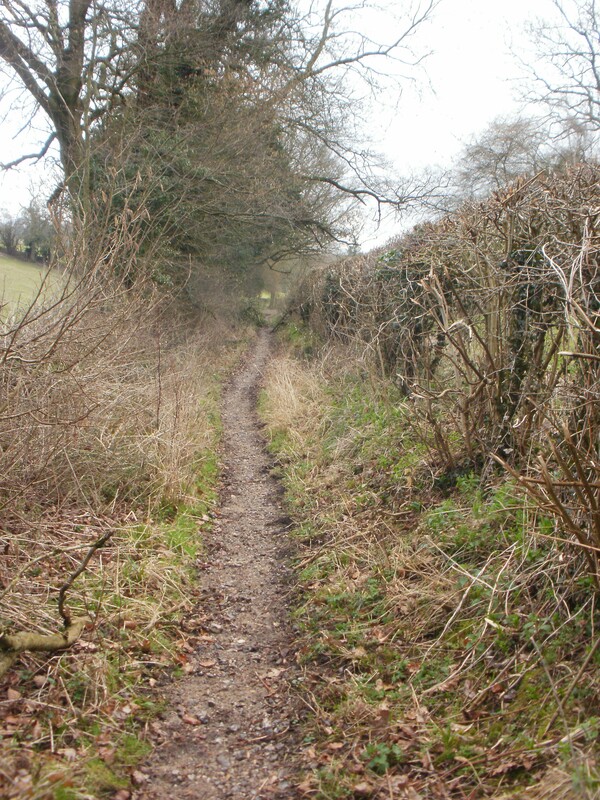 This section of our Sandhurst (Gloucs) to Sandhurst(Berks) walk was one of the longest, about 13 miles. Due to various other commitments on other weekends, we were short of alternatives, even though the weather forecast was ‘interesting’. Storm Callum was dropping heavy rain in the West Country (especially near where our walk had started in Gloucestershire). We drove through one exceptionally heavy shower, but thereafter, and surprisingly, the weather remained dry. 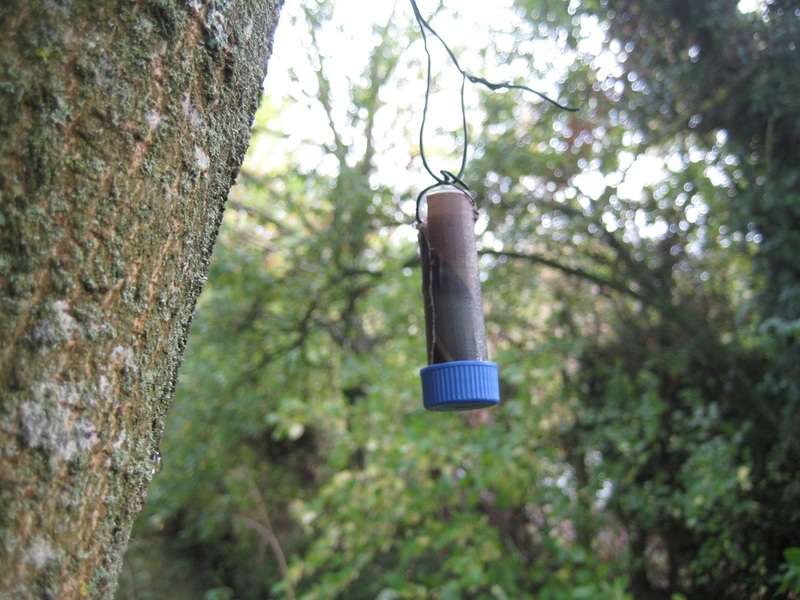 We started out from Thatcham’s Nature Discovery Centre https://www.bbowt.org.uk/explore/visitor-centres/nature-discovery-centre and found three caches in a small circular walk around its lakes. 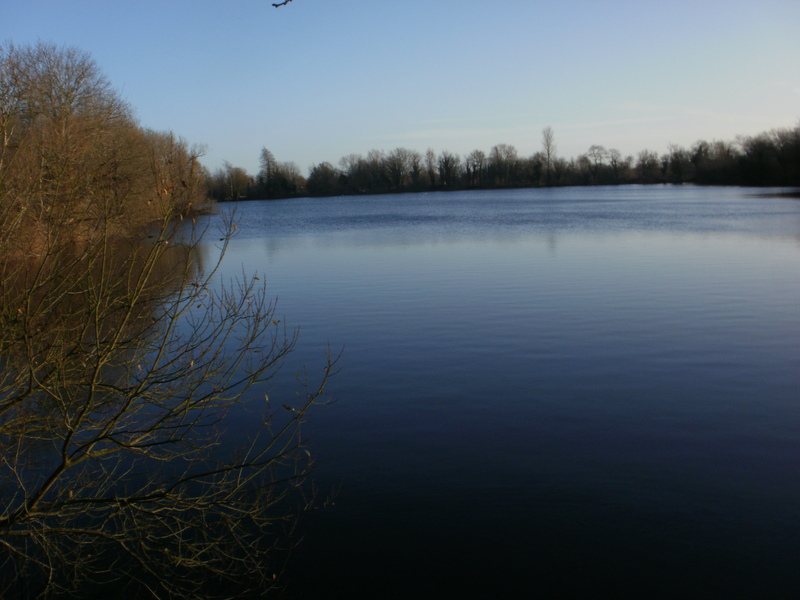 The Discovery Centre is now a wildlife haven with a myriad of lakes (filled-in gravel pits), trees and footpaths. 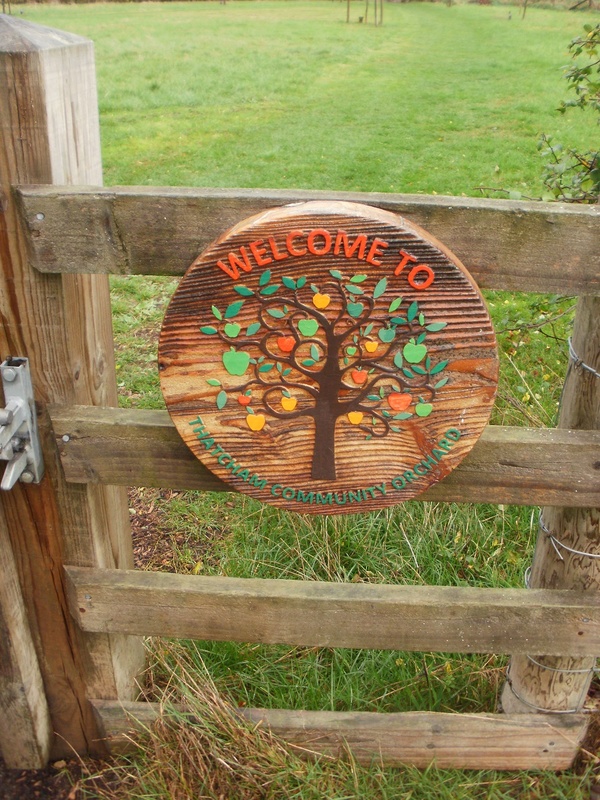 There is even a small community orchard. 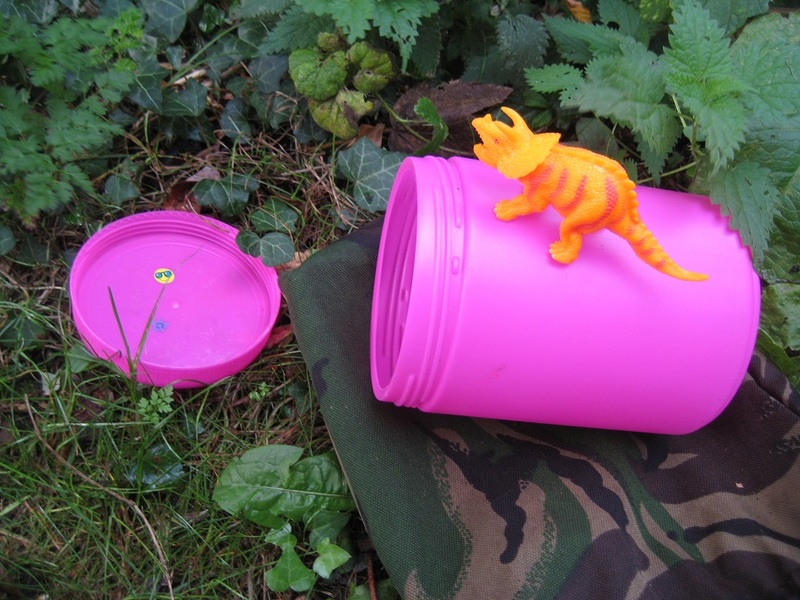 The three caches we found all had a little ‘something’ about them. 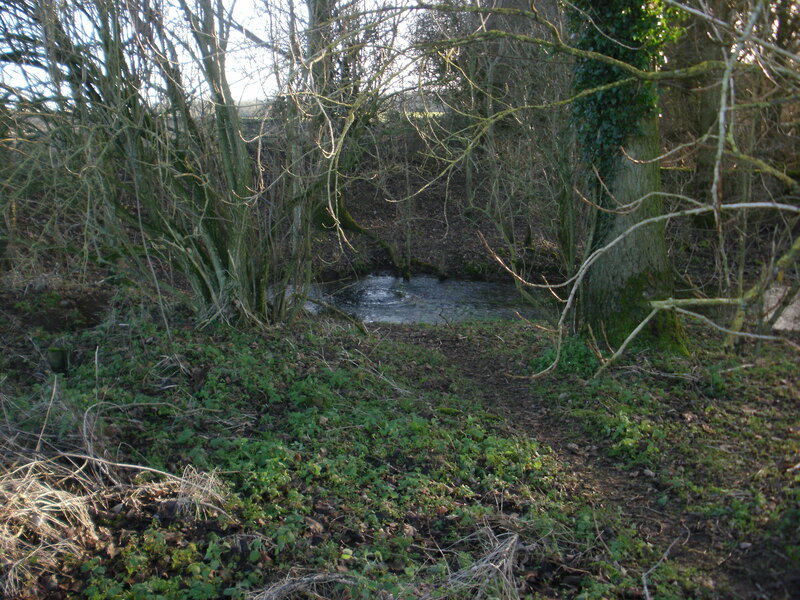 The first involved jumping across a, fortunately dry, stream. 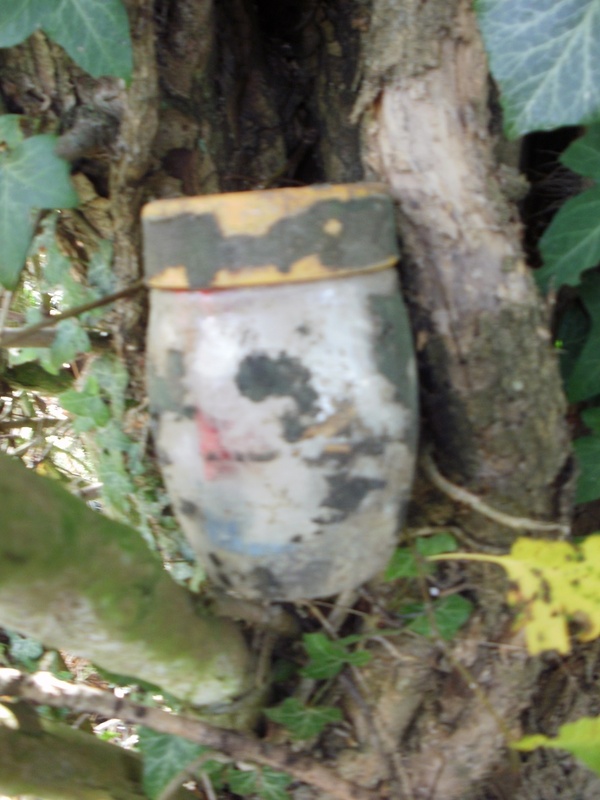 The second cache was found hanging, in plain view, yards from one of the lakes. 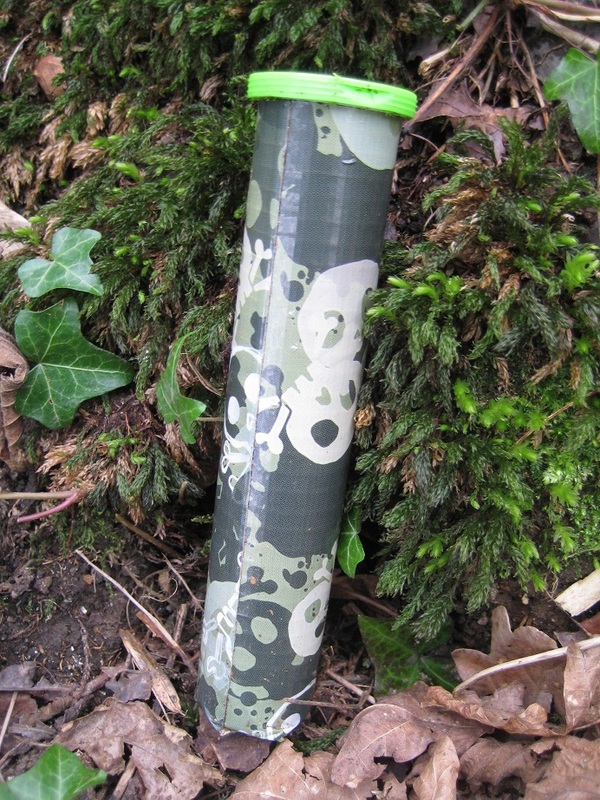 The third was hidden in a small enclosed area bounded by a gate, a fence and some trees – a quite tricky retrieval even using the geopole. Three caches down, and we were still close to the car. We crossed the Great Western Railway line before arriving at the Kennet and Avon Canal. Our previous walk had followed the canal for a couple of miles, and today we would follow it again for about 2 miles to Thatcham Station. The towpath was busy, and we saw many people exercising themselves and their dogs. We paused to admire three kites high above, and three ducks dabbling their way along a reed bed. 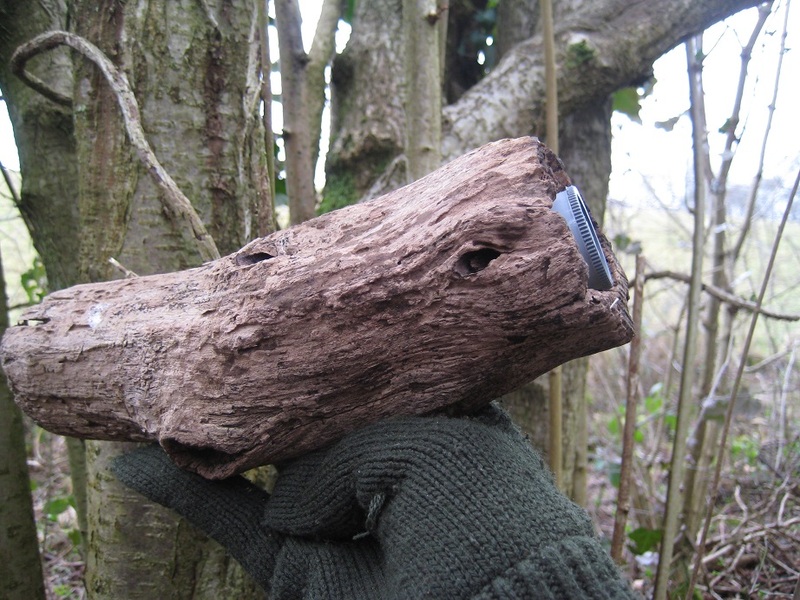 There was only one cache to find, and a quick easy find in the bole of tree. Inside we found a trackable, ‘Hilly the Hippo’. When we first retrieved the cloth toy, we initially thought it was an elephant! Then two rarities ! A seat (great for a quick coffee stop), and a turf-lined lock. Mrs Hg137 is the expert on all things canal-related, and apparently turf lined locks are rare (only two survive on the Kennet and Avon canal). Turf locks were cheaper to make, as much of the lock-sides are grass/mud/plants. 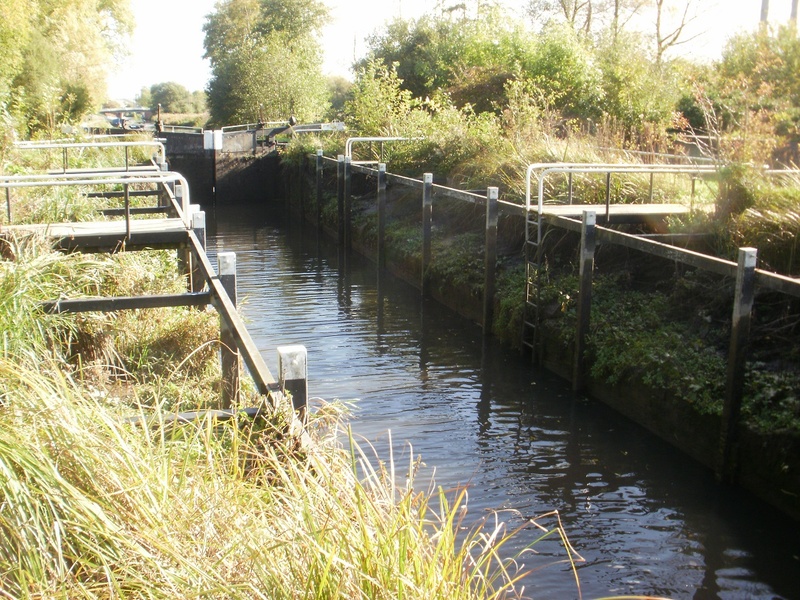 Boat owners aren’t keen on them as there are fewer places to scramble up and down from a boat, and they are more porous than other locks so the canal loses more water. 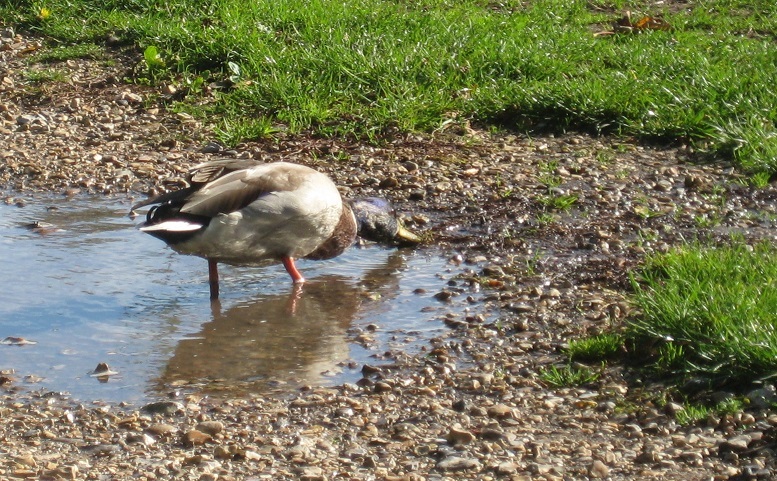 As we drank our coffee a duck wandered by, looked at us, and headed to a nearby shallow puddle. It then dabbled at the grass and water edging the puddle for 10-15 minutes, oblivious to us and oblivious to the cyclists and walkers that went by. Shortly after passing the lock we left the canal and headed away from Thatcham. The railway line is nearby, and the barriers descended for a train. We waited and watched. We waited. The queue of traffic got longer. We waited. Eventually we decided to look for an adjacent cache. We dipped just out of eyesight of the stationary motorists and made a quick retrieval. More surprisingly there was another a trackable inside “Smelly Pooch”. 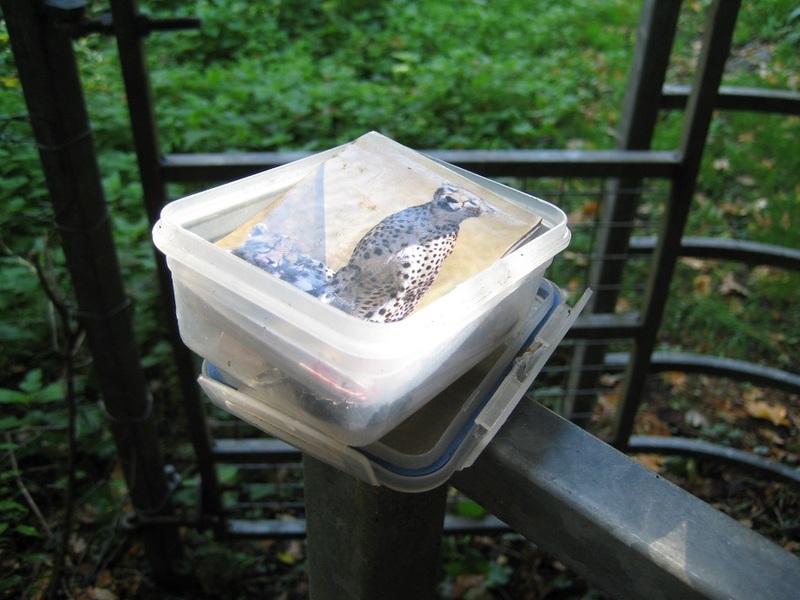 Two consecutive caches, and two trackables – not bad! Somewhere beyond the branch is a cache! We crossed away from the traffic and picked up a series of caches under the title of “Let’s go Round again” – apparently named after a favourite walk of the cache owners, TurnerTribe. By and large these were easy finds, sometimes there was a small scramble down a ditch, on another we had to lift and separate a large log pile. We struggled with one or two where we overthought the hint, but these were the exception. As we approached one cache we heard a strange squealing sound..and a lady shouting at her dog. The squealing wasn’t a dog noise, it wasn’t a rusty swing… what was it ? 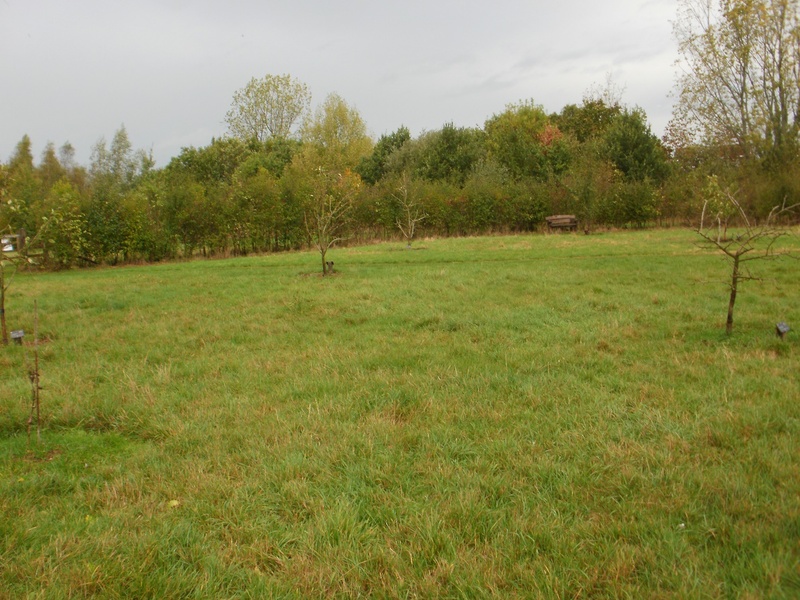 Then, as we knelt to retrieve the cache we saw the source of the squealing… a smallholding of pigs! 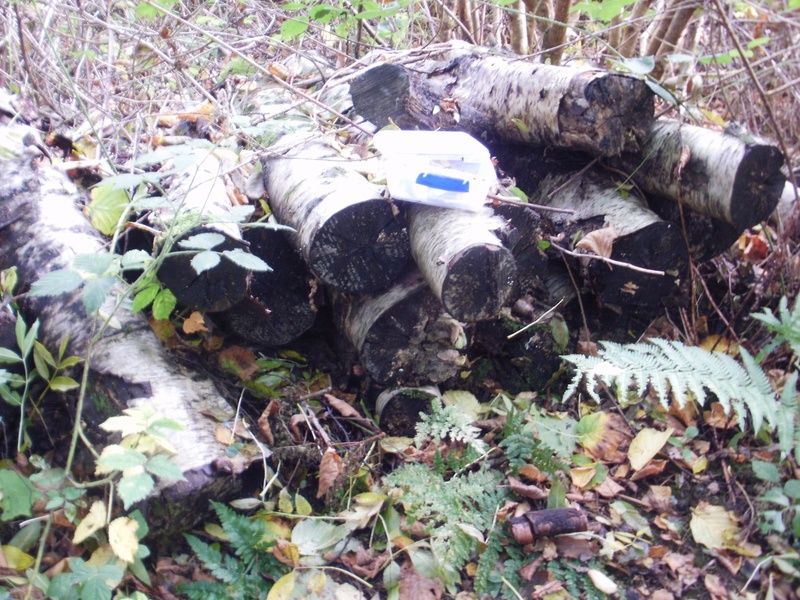 We were counting caches as our 12th find of the day would be our 2500th find! To mark this auspicious mark, we would have liked a memorable hiding place, or a really special container.. sadly not to be! 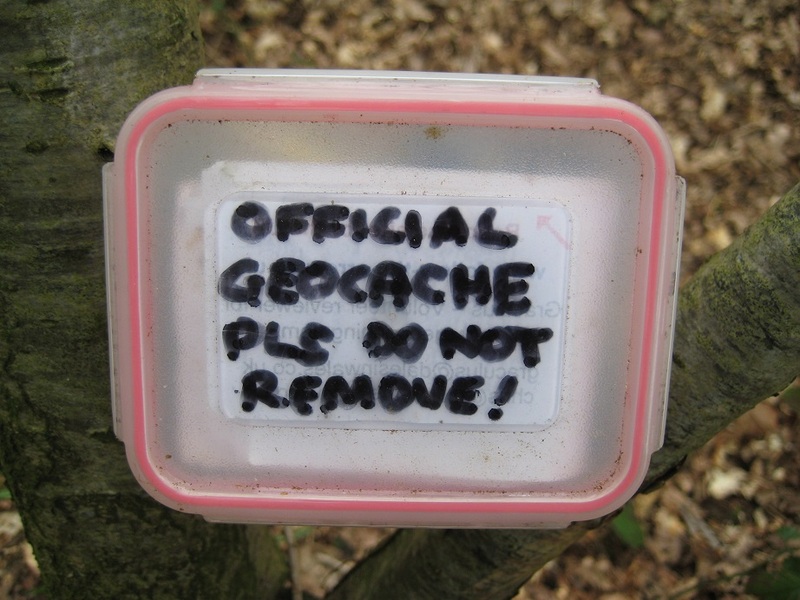 (Ed: for the record we started in caching in September 2012, so it took us just over 6 years to find 2500 caches). We were still celebrating when we arrived at the next cache site. This was set by TadleyTrailblazers (a cacher we met 3-4 years ago). Sadly we couldn’t find the cache. A lovely oak tree, with lots of boles, holes, nooks, crannies… but no cache. Cache 2501 would have to wait a little longer! Mm.. lets go in the other direction! We found a couple more of the ‘Let’s go Round again’ series, and arrived at a road. We had been dreading this part of the walk as we had half a mile of road walking and then another two miles on cacheless footpaths. The countryside was reasonable enough, but our navigation was poor. 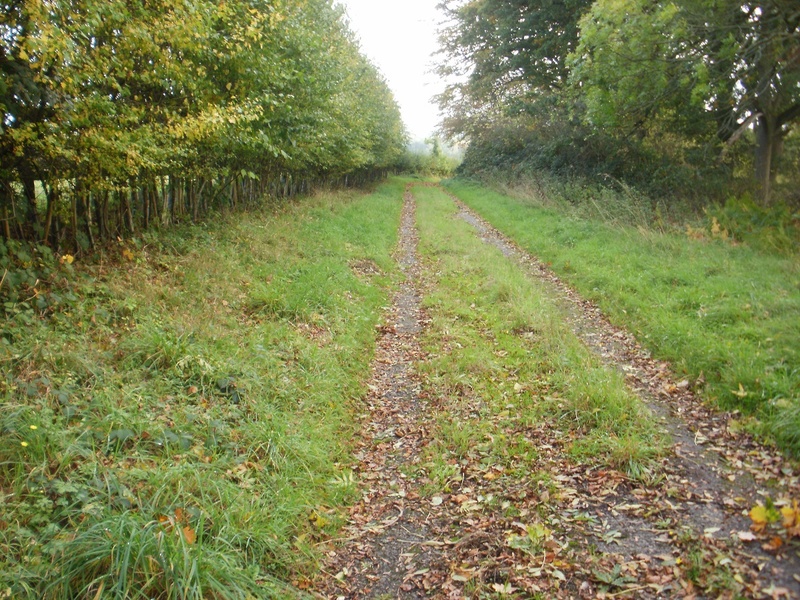 (Once we decided, sorry – Mr Hg137 decided, to ignore a footpath sign and walk for 500 yards into ever-denser undergrowth. Another sign for us to ignore! 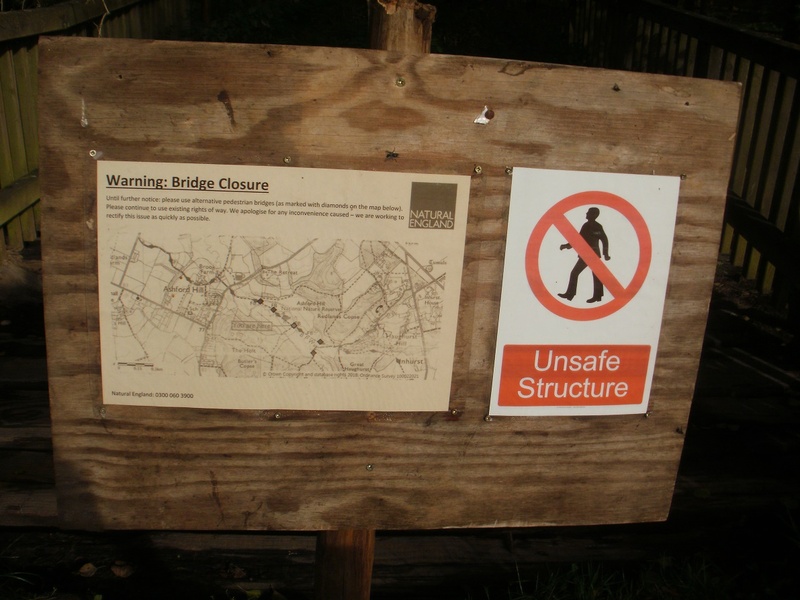 On anther occasion the main footpath was closed for bridge repair works. We ignored the closure sign and 400 yards further on found ourselves impounded in a barbed wire enclosure. Grr!). It was therefore with some delight we reached a set of caches. 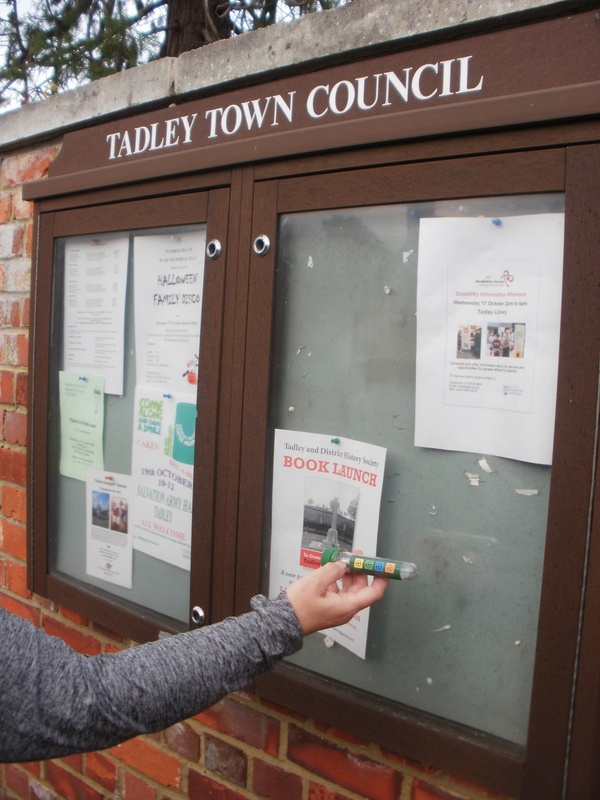 We were a couple of miles from Tadley, and it came as no surprise to discover that they had been set by TadleyTrailblazers. We walked across two of his series (TTs Mini tour, and A2B&B (Axmansford to Baughurst and Back!). 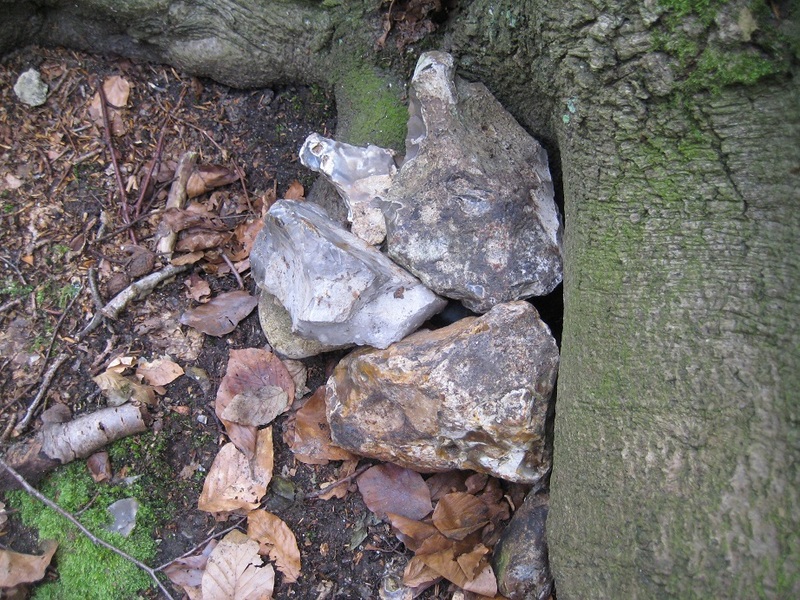 These were all fairly easy finds – 5ft in a tree, by a gate post, deep in a hedge. The one that we enjoyed most was hidden behind a ‘swinging’ piece of wood. 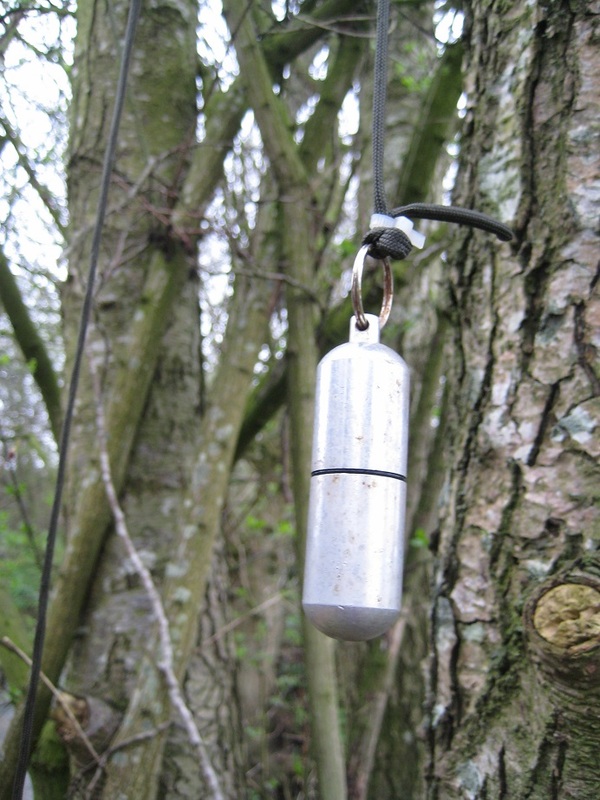 Swing the wood, and find the cache! We struggled with our next cache (set by Buddy01189). We haven’t done any if his (her?) 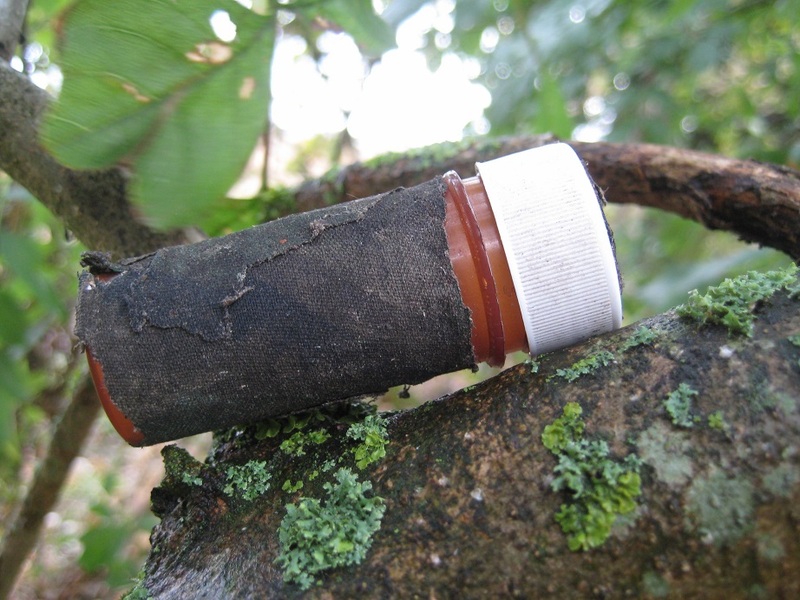 caches before, and apparently there is frequently an evil twist. The caches are hidden fairly, but with a warped mindset. We couldn’t get into the warped mindset (and after 10-15 minutes we tried really, really hard),so marked it as a DNF. Having had a failure at one cache, lady luck smiled on us at the next. A Church Micro Multi.To find the final we needed to find dates from a plaque and numbers from a war memorial. We tried to do this before we left home, but no internet photographs gave us the necessary information. We were very concerned the final hide would be half a mile back the way we came. But, we had one other piece of information. The hint. The hint, rather than being ‘base of tree’ or ‘MTT’ or ‘hidden in ivy’, was a very specific number – 57.1. As we approached the church we scanned every conceivable lamp-post, telegraph pole, telephony cabinet for such a number. Then as we could just see the church in the distance we spotted an object at ground level. (One pertinent to an allied industry Mrs Hg137 has some dealing with). As we remarked on the object we saw the associated number…57.1. Is there a cache behind? Yes !!! Fab! We wouldn’t need to retrace our steps! 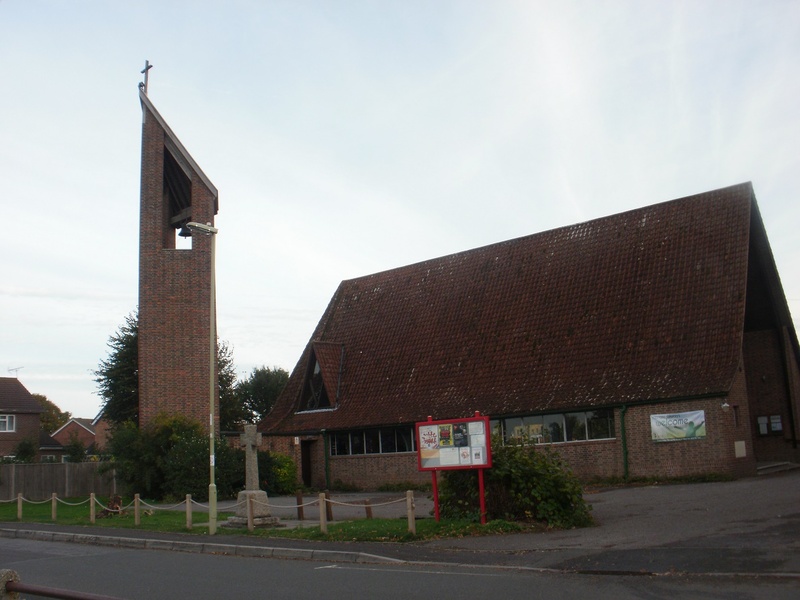 We did visit the outside of the modern church, and the adjacent village green. A good refreshment spot. It was getting quite late by now and the pleasant temperatures were dropping as were the light levels. We still had a mile to go (one easy cache to find), and walk through ever-darkening wood. The woodland paths led us out at Silchester Green and we were happy to see, in the early evening gloom, our car in the distance. 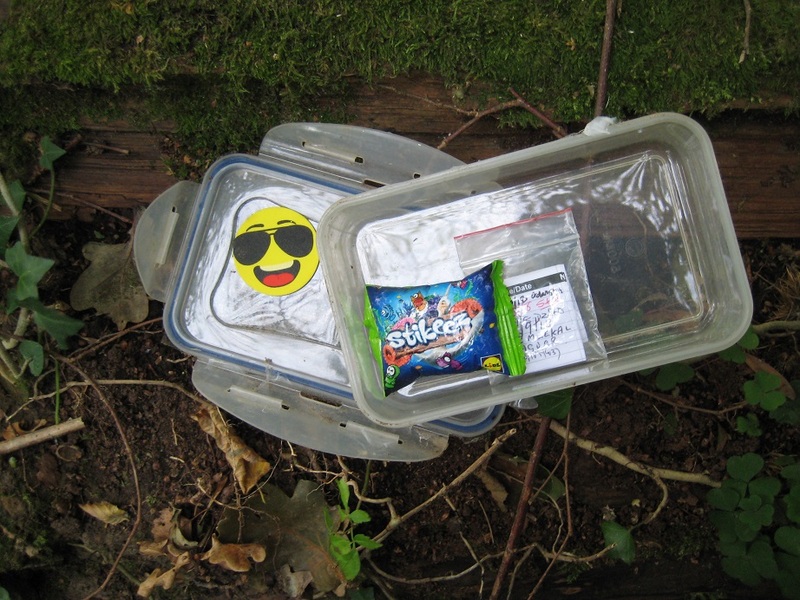 But first… one more cache. In a bus stop. Our GPS told us which of two shelters the cache was hidden in, but in very poor light, in a dark ‘shed-like’ shelter, we couldn’t find the cache. We did though find lots and lots of spider’s webs! Yuk! 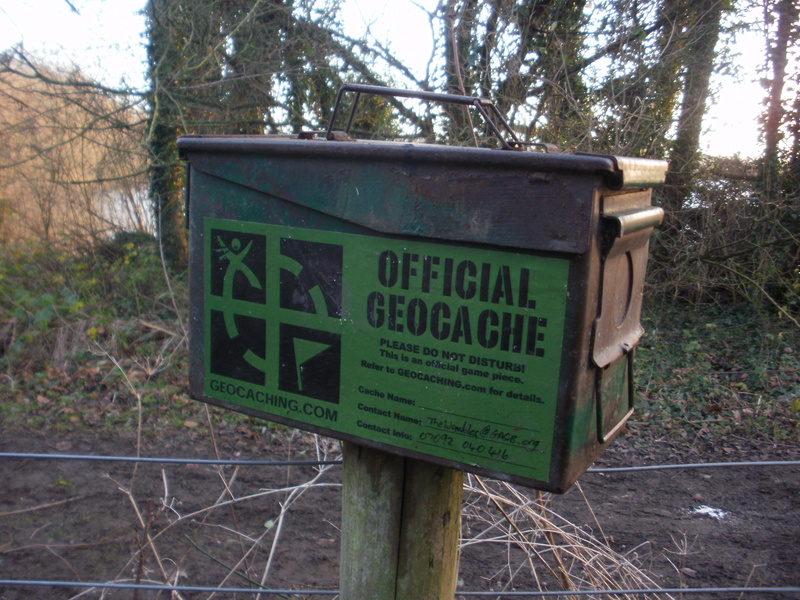 A slightly disappointing end to a strenuous day – 3 DNFs in total, but we did find 20 caches including our 2,500th find. Something we could celebrate! 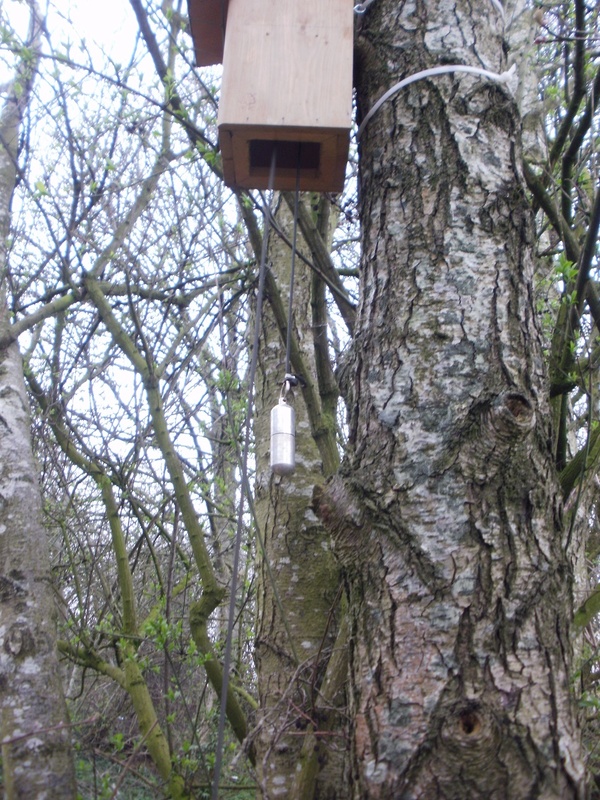 … and then we spotted across the road from our hotel was a Nature Reserve, the Horsbere Nature Reserve and its series of caches placed by the Reserve Rangers. The nearest cache to the hotel, intrigued us most.. it had attracted over 40 favourite points since being placed in January 2017. 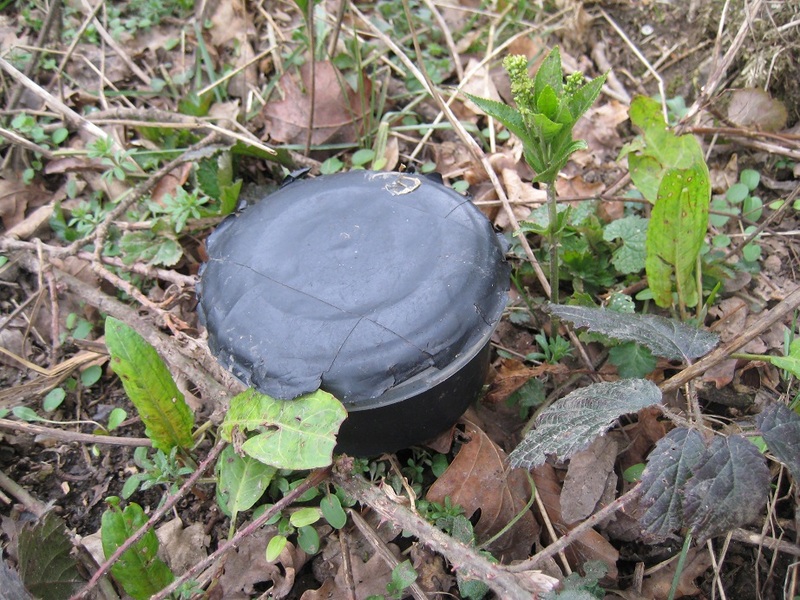 This cache would be our time-killing target! 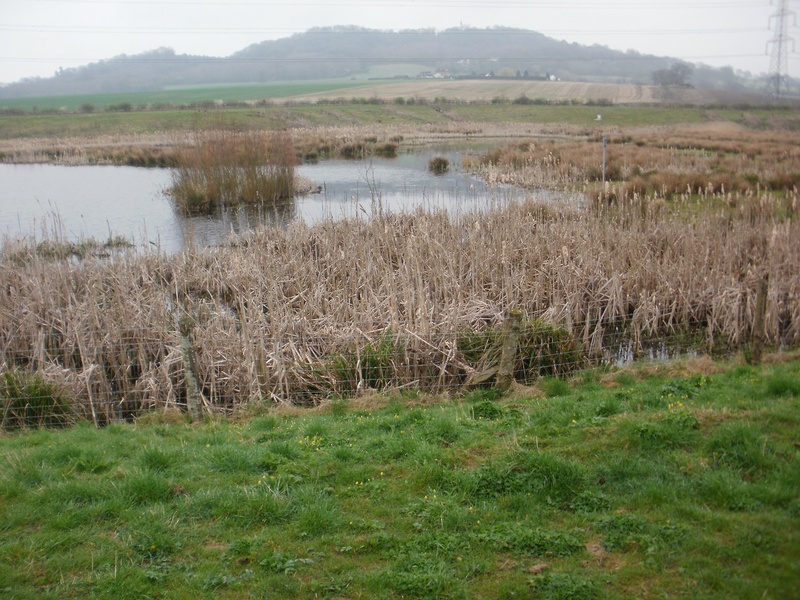 The Nature Reserve had only been established since 2010 as a part of flood protection scheme. 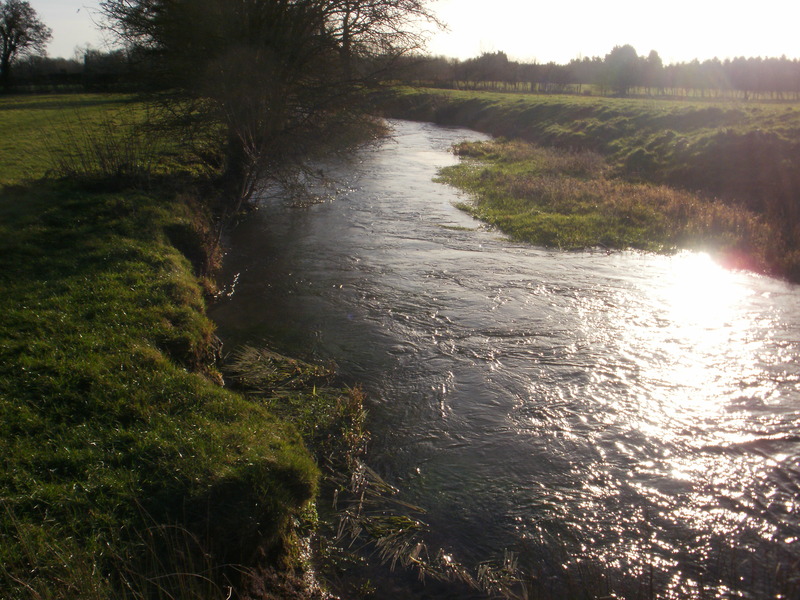 Prior to that 300 Gloucestershire homes were regularly flooded after sustained heavy rain. 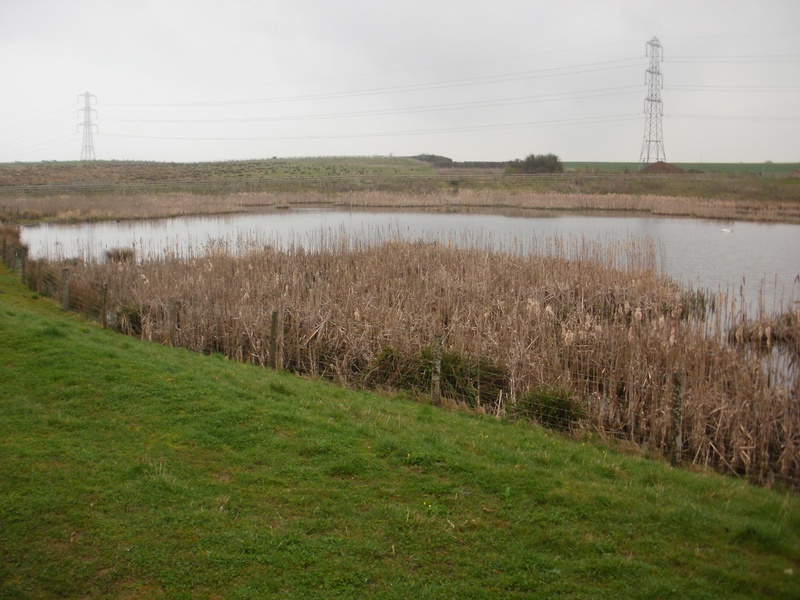 Back in 2010 a huge ‘depression’ was created that would hold 70 Olympic Sized pools-worth of water. Rain would be collected in the ‘depression’ and slowly released into local drainage channels after the rain had passed. Surrounding the depression (aka lake) is is mixed vegetation so of course wildlife has moved in. But what of the cache ? It was called “Ranger’s Walk – Little House On Horsbere” – what could that mean ? 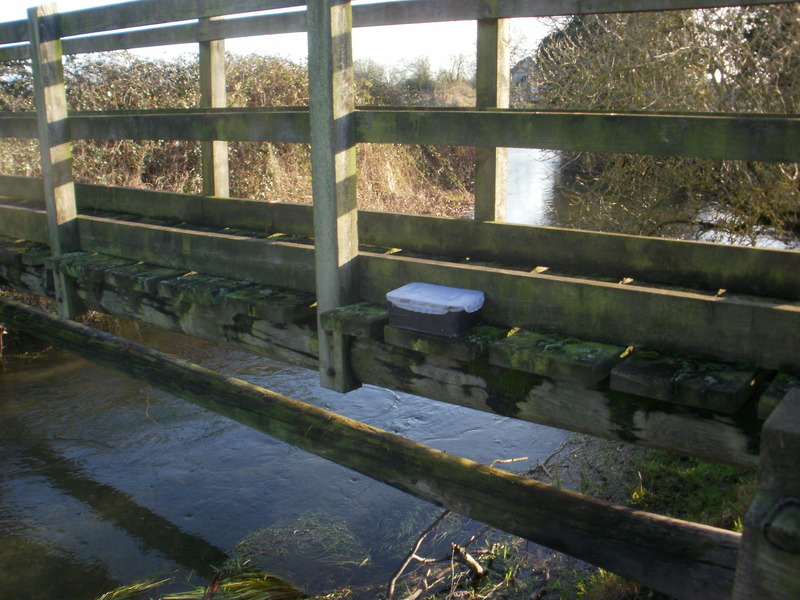 And then we saw it, near to a weir – a ‘closed’ bird box. Hanging beneath were two cords. Careful pulling on one of them caused a bison tube to appear from the bird-box base. Very clever! We unscrewed the bison, taking great care not to let go of the cord, removed the log and signed it. Pulling the other cord caused the bison to rise.. and the cache was hidden again! 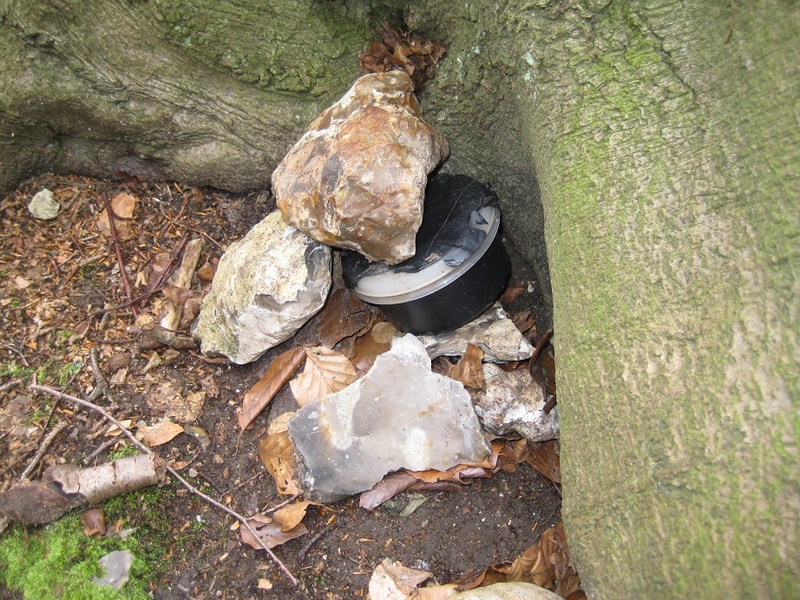 A beautiful cache in a very peaceful setting. Well worth attempting while the shops were closed! Rural Oxfordshire: the geocar turns into a narrow lane. It is narrow and mud-covered and Mr Hg137 pulls up, concerned that it does not lead to the parking he hopes for. I walk on down the lane; a car passes, I see a few houses, and then the parking place. Mr Hg137 is mollified and we proceed, park, and set off on our geocaching circuit. And so started our assault on the undulating (a.k.a. 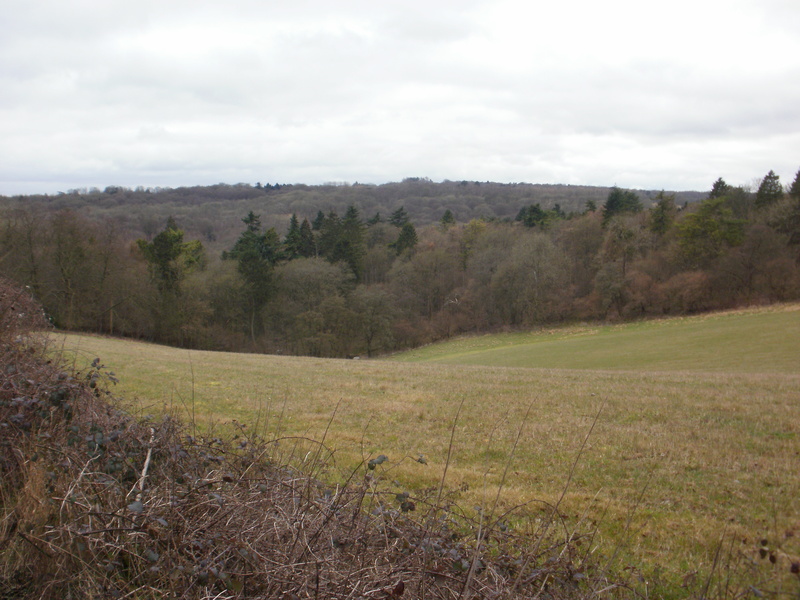 hilly) Chilterns Ramble, near Nettlebed in Oxfordshire. It was a cold, grey, day, but it had not rained for a while and we hoped it would not be too muddy. 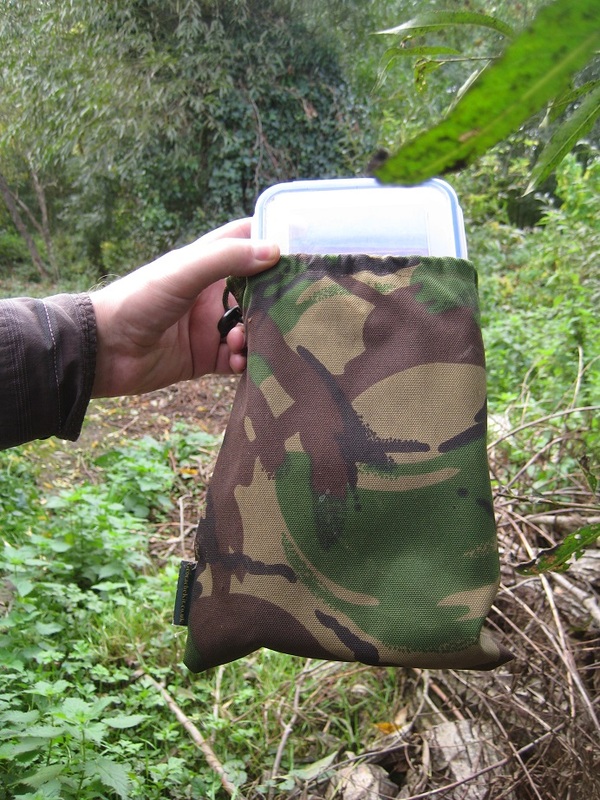 We headed gently downhill, finding caches as we went, along a path, then a track, and on through a nature reserve. All that downhill walking was repaid by a sharp uphill climb; hmm, we had suspected that would come sometime. 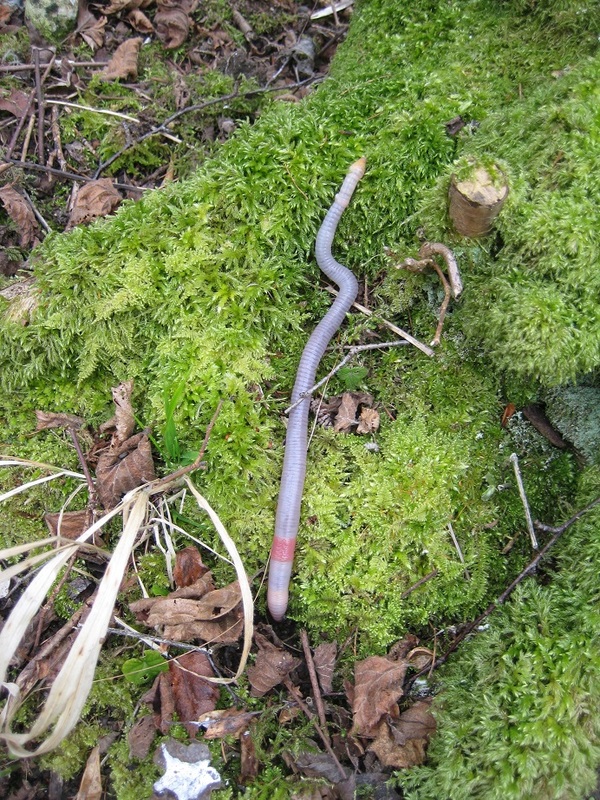 A cache halfway up the hill gave us a moment for a breather, and also a chance to admire the most enormous worm adjacent to the cache. It was several inches longer than the outstretched span of my fingers, and my picture does it no justice. 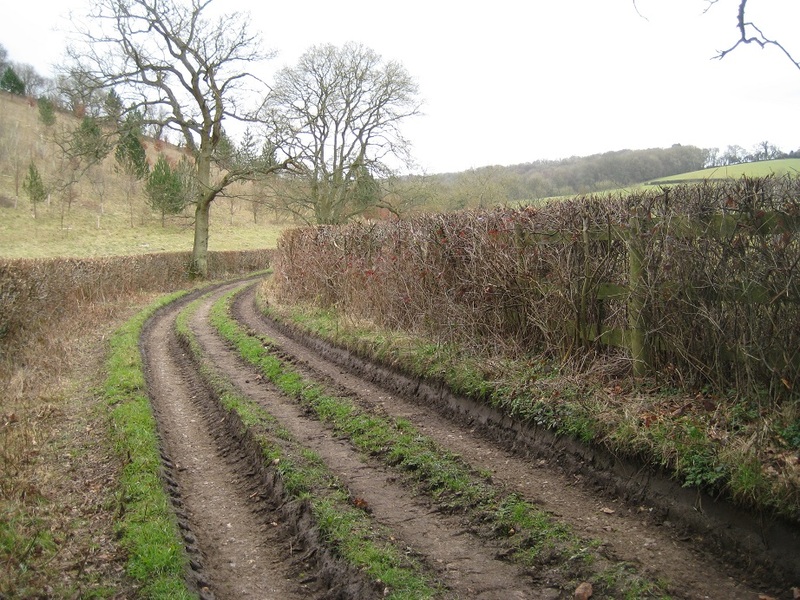 We turned away from the hill climb – and that worm – to cross fields, and contoured along the side of the hill and through woods, finding another few caches as we did so. In a few weeks these woods will be bursting with bluebells, but when we walked through they were bare, with just a few shoots emerging. 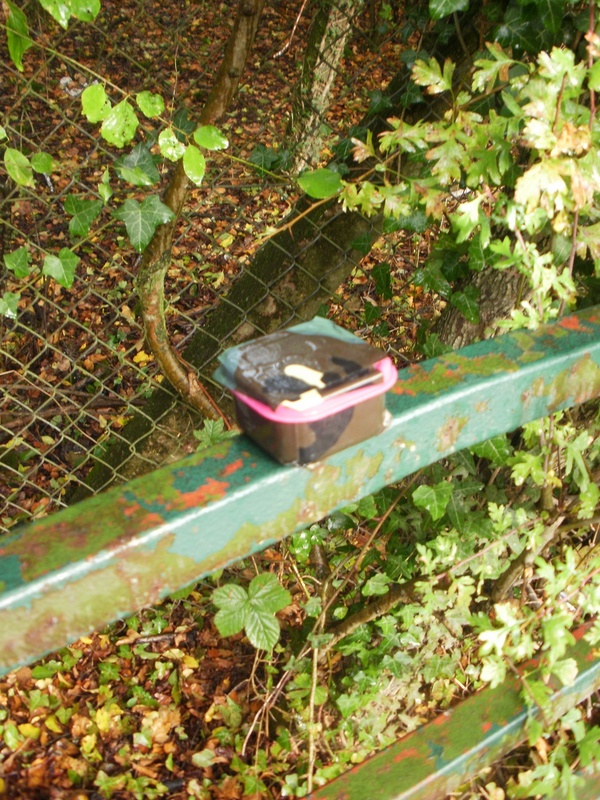 After lunch, taken on a handily placed seat, it was back to the caching trail again, to find the next few caches on this sixteen cache circuit. 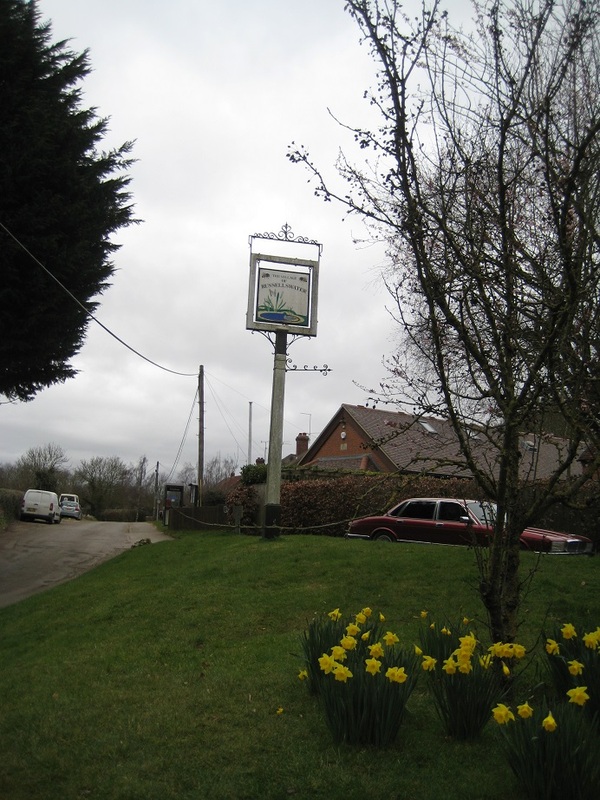 On our way out of the village, we paused to get another cache entitled ‘Russells Water’; we were only the third cachers to find it, as it had only been out for a week when we found it. Downhill again, we headed off to find another cache up a side track before returning to the Chiltern Ramble series. We only had four caches left to find now, but it had got colder and darker, the remainder of the route was uphill, and steeper, and muddier, and suddenly those extra diversions maybe hadn’t been such a good idea … But we did find the remaining caches and emerged back onto the lane just a few yards from our parking spot. We were muddy and we were tired – this had been our longest walk since finishing the Thames Path almost three months earlier, but we were triumphant, having found all nineteen of the caches we had attempted. Result! After overnight rain, the day dawned bright and clear. 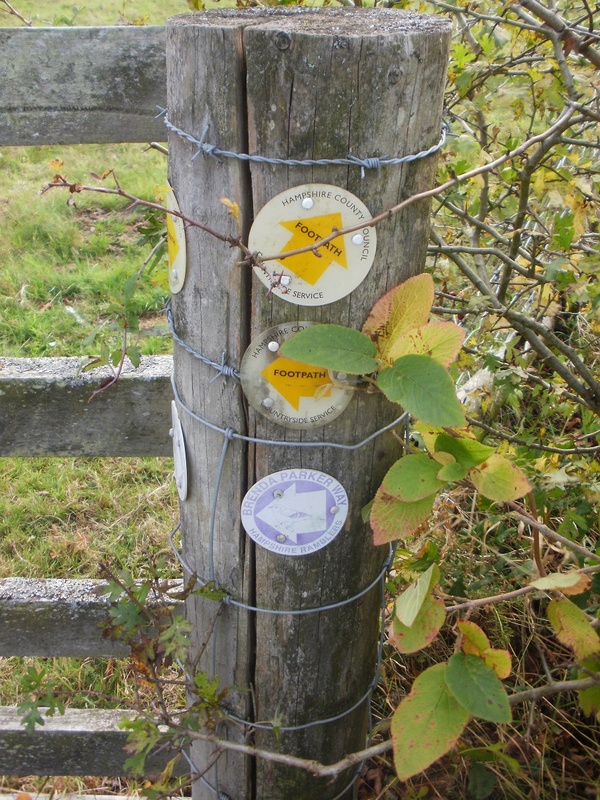 The temperature for a winter’s day was ideal for walking and so we started our challenge route along THE THAMES PATH. 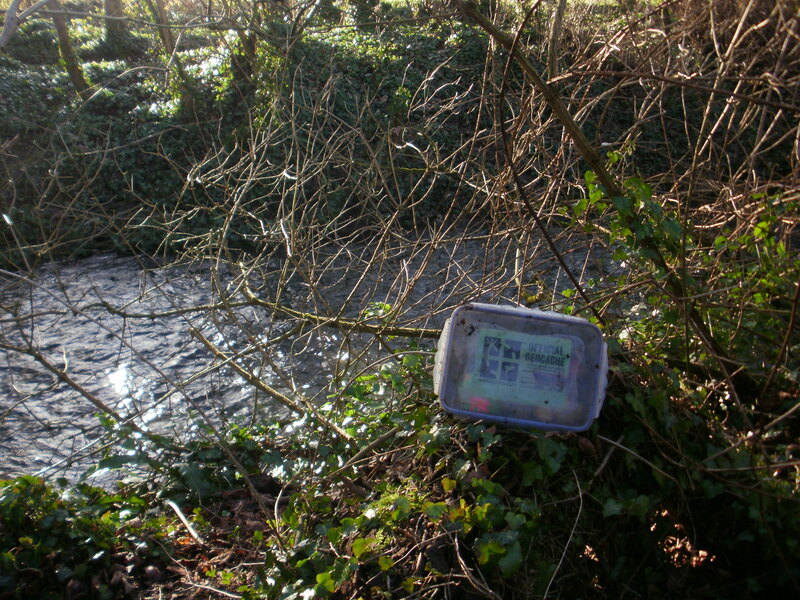 The source of the Thames, Thames Head, is marked by a large inscribed stone and close by was our first cache of the day. A very simple find and a fair sized container too! Thames Head is where the Thames rises after a particular wet winter. Although it had rained overnight, there was no sign of any water! Indeed there was no water in the ‘stream channel’ for a mile. Sheep in the background, but a mile from the source.. still no river! Here the water came from a bubbling, almost volcanic, spring called Lyd Well. From here the stream was very wide but shallow in depth. 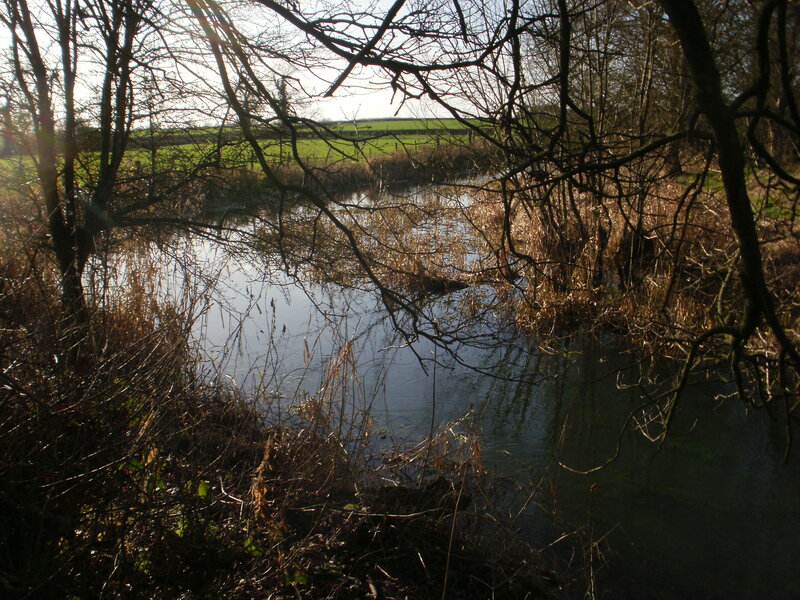 As the river grew in stature, so did the number of potential caches. Our next location (near an Information Board) provided us with our first (of three) Did Not Finds of the day. We weren’t helped by the presence of a camper-van, whose occupants wanted a chat thus delaying our search. 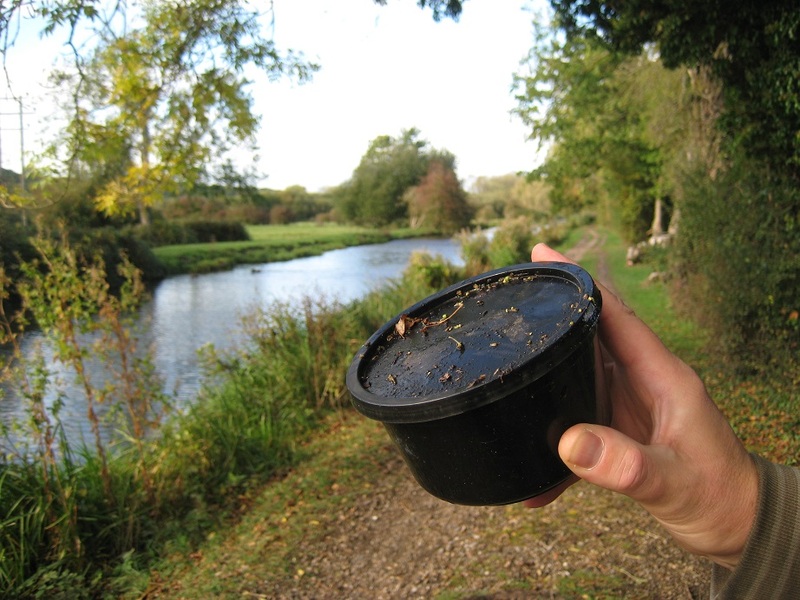 Our luck turned at the next cache and continued as the Thames Path passed with feet of the fledgling river. 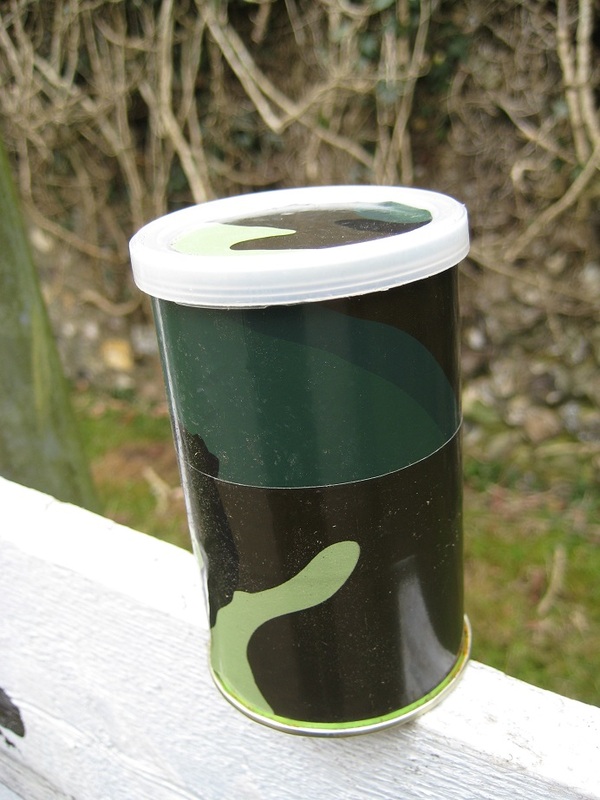 The containers were varied – though predominantly much larger than film canisters we had become accustomed to locally. 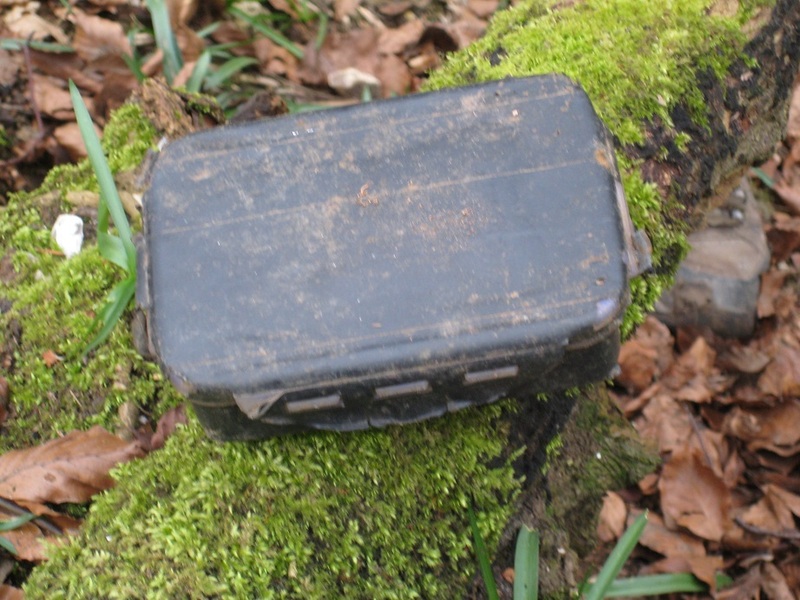 Indeed the only film canisters were IN a cache – as the Cache Owner had hidden the log in a film canister, but which one ?! 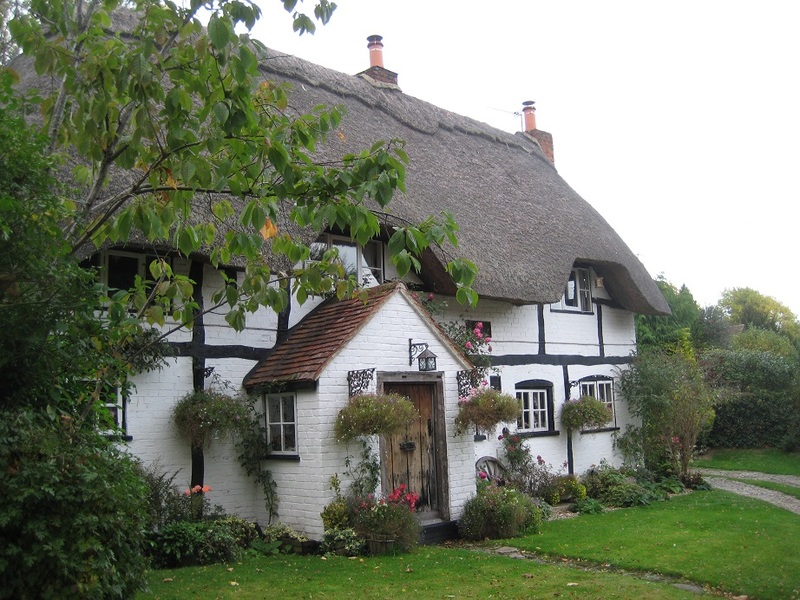 The only habitation we passed through was the small Cotswold village of Ewen which hosted a number of caches (including a puzzle cache we had solved before leaving). 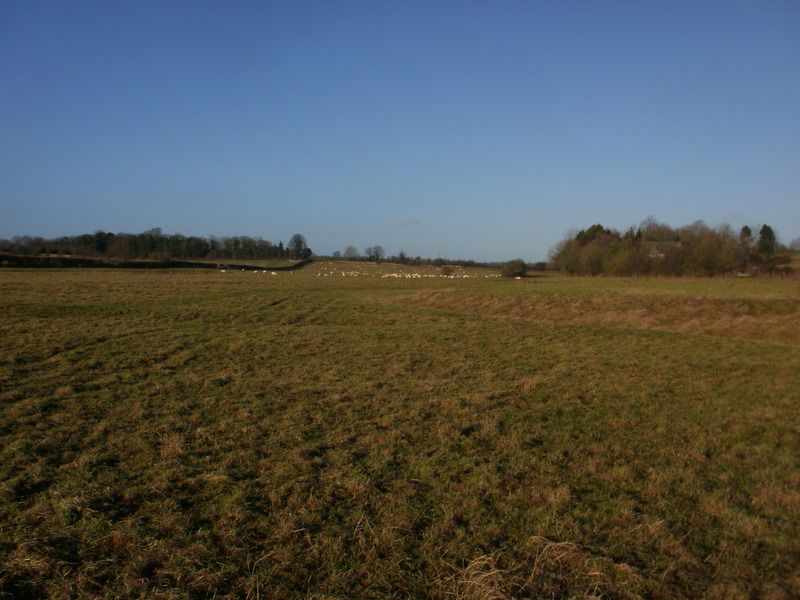 Leaving Ewen, the river meandered around various fields, and unsurprisingly many of the field boundaries were hosts to caches. 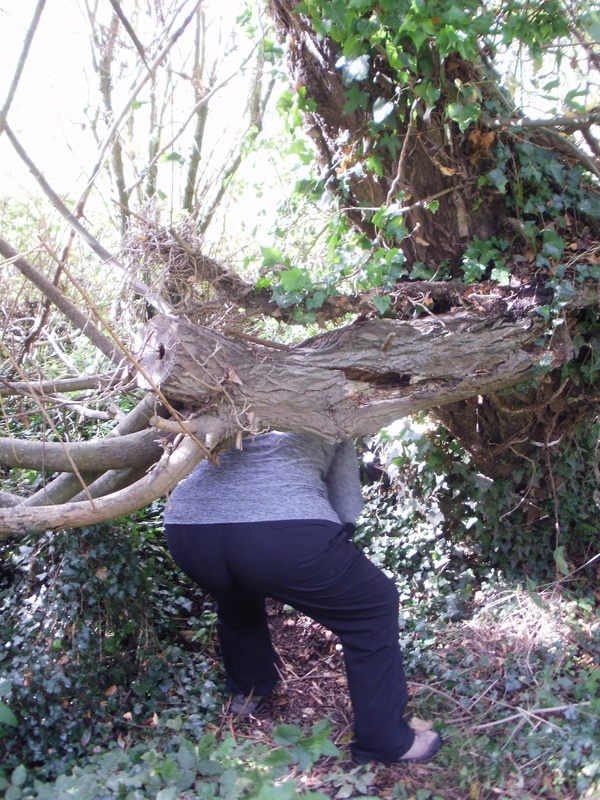 One such GZ, at a metal stile, was our second failure of the day – reading the online logs the term ‘sneaky hide’ – well it was too sneaky for us! 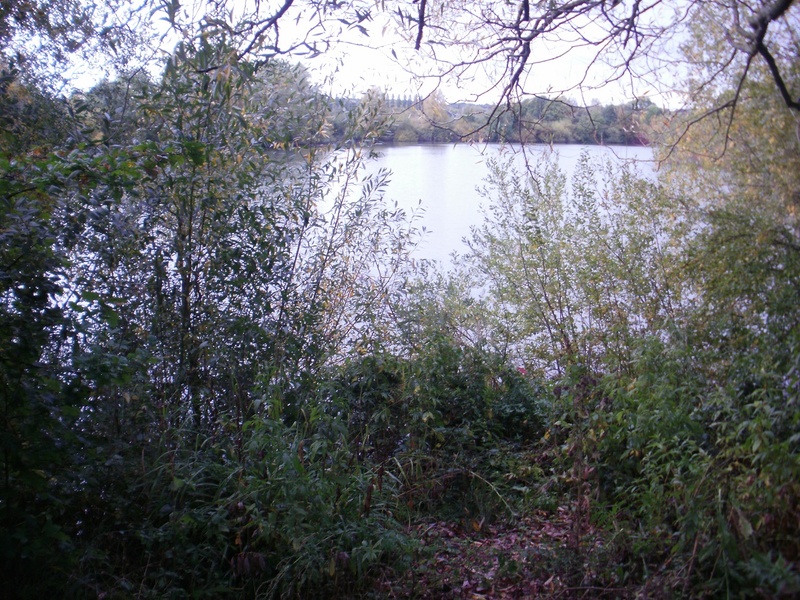 About a mile of so before Ashton Keynes, we entered various Water Parks where former gravel pits had been turned into lakes, and Nature Reserves. The Thames somehow twisted and turned around several of these lakes and yielded many caches and also a geo-coin from Utah. Prior to arriving at the lakes, caching was easy as there was barely a soul on the Path, but the lakes attracted many a dog-walking muggle so our last few finds, were little more hurried than earlier in the day. PS If you’ve found this blog by accident and want to hear about how the rest of our journey turns out why not Subscribe ?